ALOE BARBADENSIS LEAF JUICE*, PURIFIED WATER (AQUA), VEGETABLE GLYCERIN, CETYL ALCOHOL, ROSA CANINA (ROSEHIP) FRUIT OIL*, DICAPRYLYL CARBONATE, GLYCERYL STEARATE, STEARIC ACID, BIOSACCHARIDE GUM-1, ALLANTOIN, OLIVE SQUALANE, PUNICA GRANATUM (POMEGRANATE) SEED OIL*, PLANT STEM CELLS (ALPINE ROSE, MALUS DOMESTICA, SOLAR VITIS) and BIOACTIVE 8 BERRY COMPLEX*, SOOTHING COMPLEX: [SODIUM HYALURONATE, MAGNOLIA OFFICINALIS BARK EXTRACT, BOSWELLIA SERRATA (BOSWELLIN) EXTRACT], PANTHENOL, ETHYLHEXYL PALMITATE, LECITHIN, ZEA MAYS (CORN) STARCH*, ROSA DAMASCENA (ROSE) FLOWER DISTILLATE*, VACCINIUM MACROCARPON (CRANBERRY) JUICE*, CAMELLIA SINENSIS (WHITE TEA) LEAF EXTRACT*, ASPALATHUS LINEARIS (ROOIBOS) EXTRACT*^, TOCOPHEROL, PHENETHYL ALCOHOL, ETHYLHEXYLGLYCERIN, ROSE ISOLATES, VANILLA ISOLATES, PELARGONIUM GRAVEOLENS (ROSE GERANIUM) FLOWER OIL*, CITRUS AURANTIUM DULCIS (ORANGE) PEEL OIL*. *CERTIFIED ORGANIC INGREDIENTS, ^FAIR TRADE INGREDIENTS. For external use only. Avoid direct contact with eyes. pH balanced and hypo allergenic. Andalou Naturals have indeed produced a beautiful cream. 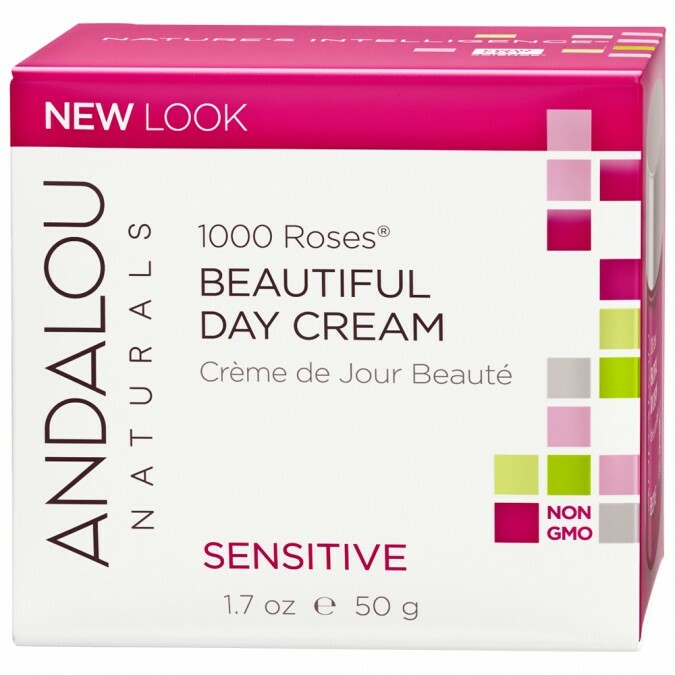 I could enjoy the delicate fragrance and instantly feel the silky soft cream moisturise and nourish my sensitive skin. I will definitely be purchasing this product again.